I first met Steve MacManus when he was signing copies of his memoir 'The Mighty One' at Orbital Comics (see pictures below). RS - For those who haven't read this book can you describe what the book is about? RS - What inspired you to write about Elmsworld? SM - I'd really enjoyed writing The Mighty One about my time in British comics editorial, so I toyed with the idea of writing a prequel. My mind was made up when I discovered there was a Facebook group for former pupils like myself — it had eight hundred members and I was sure some of them would be interested to share in the nostalgia — for the price of a couple of pints! RS - Two books in relatively quick succession - Any plans for volume 3 of your life story? Or maybe some fiction? SM - Definitely. I am writing a novel which I hope to publish later in 2019. They say one should write about what you know, so you won’t be hard-pressed to guess the subject matter…! RS - Would you / did you send (your) children to either Elmsworld itself, or its modern equivalent? SM - Without a doubt. I would have had an amazing career as a professional footballer and doubtless captained my country in the 1978 world cup finals. RS - Can you explain who the woman on the front cover is? SM - The cover photograph is by Steven Cook, who I knew from working with on 2000 AD and other titles. He has an amazing website showing his photographic work over time. https://www.steven-cook.com/Alternity. I was perusing his site, looking for an image that would be symbolic of all the girls I knew at Dartington, and Steve's photograph of Susan was perfect. Apparently, she was an early girlfriend of his. 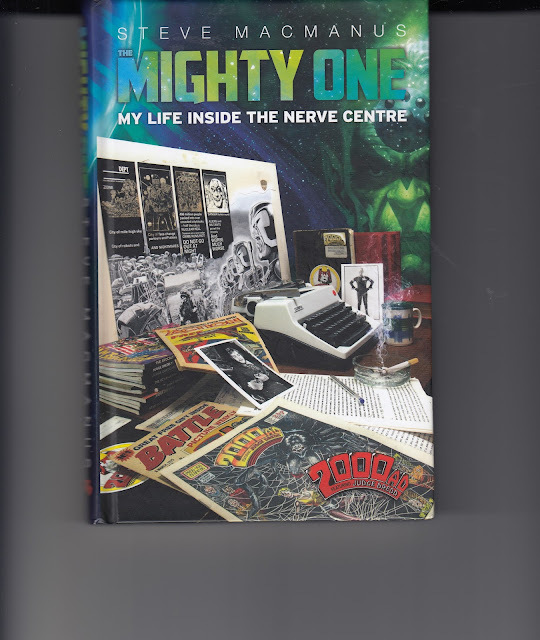 For collectors of all things Steve related don't forget that as well as the usual paperback edition (now up to its second printing) there was also a limited edition (200 copies only) hardback edition of his 'The Mighty One - my life inside the nerve centre'.